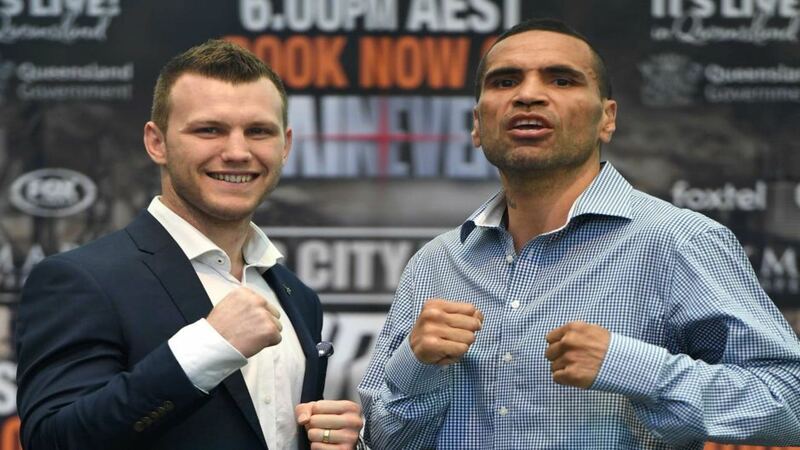 Jeff Horn vs Anthony Mundine will air on ESPN+ starting at 3:30 AM ET. The latest edition of Breakfast and Boxing on ESPN+ will be streamed live from Down Under this Friday, as former welterweight world champion Jeff “The Hornet” Horn and former two-time super middleweight world champion Anthony “The Man” Mundine will settle a long-simmering Australian grudge match in a 12-rounder from Suncorp Stadium in Brisbane, Australia. The ESPN+ stream will begin at 3:30 a.m. ET, with Horn and Mundine expected to enter the ring at approximately 6:30 a.m. ET. burst onto the world boxing scene in 2017 with a year for the ages. In front of more than 50,000 fans at Suncorp Stadium on a sunny July day, he defeated living legend Manny Pacquiao by close unanimous decision to win the WBO welterweight world title. A former teacher who represented Australia at the 2012 Olympics, Horn defended his title later that year with an 11th-round TKO against Gary Corcoran. Horn’s good fortune finally ran out June 9 in Las Vegas against pound-for-pound elite Terence “Bud” Crawford, who snagged Horn’s belt via dominating ninth-round TKO. a 43-year-old former professional Australian rugby player, turned pro in 2000 following a limited amateur career. His professional career has been a fascinating one, as he’s fought as low as super welterweight and as high as cruiserweight. Mundine first captured the WBA super middleweight world title in 2003 with a unanimous decision victory against Antwun Echols, defending the title once before a split decision loss to Manny Siaca. He knocked out countryman Sam Soliman in the ninth round on March 7, 2007 to win the WBA super middleweight world title for second time. Since then, he has taken part in some of Australia’s most high-profile boxing events, including a 2013 TKO win against future Hall of Famer Shane Mosley. Mundine rebounded from a 1-3 skid on Jan. 17, knocking out Tommy Browne in the second round. In undercard action, Australian welterweight contender Cameron “The Hammer” Hammond (17-1, 9 KOs) will take on Frank Rojas (23-1, 22 KOs) in a 10-rounder for the WBA Oceania welterweight title. Australian super featherweight champion Brent Rice (8-0, 2 KOs) will make the second defense of his belt against Liam Wilson (2-0, 2 KOs) in a 10-rounder, and middleweight prospect Ben Mahoney (5-0, 2 KOs) will step up in class versus Adrian Rodriguez (11-1-2, 5 KOs) in a five-round clash.